A new skull from long-necked dinosaur Diplodocus, along with being the smallest ever found, is helping to unravel the mysteries of the giant dinosaurs grew up. Sauropod dinosaurs (the long-necked herbivores like “Brontosaurus”) represent the largest terrestrial vertebrates to ever walk the Earth. Some sauropods tipped the scales at 37 meters in length while others could have weighed in excess of 30 tonnes. Thus nearly every part of a sauropod’s anatomy is a testament to the biomechanics of extreme size. But the biggest animals in Earth’s history did not start their lives as giants; sauropod eggs are approximately cantaloupe-sized. This means the biggest animals of all time had a lot of growing to do. A new skull of the sauropod Diplodocus from Montana is helping us better understand how the heads and diets of these titans changed throughout their life. To preface this, sauropod skulls are extremely rare. While over 100 Diplodocus specimens are known, fewer than a dozen skulls exist. We not only had a whole skull, we had a skull from the youngest and smallest Diplodocus ever found. Sauropod teeth simplistically come in two varieties: 1) peg-like for softer foliage, and 2) spatulate for coarser vegetation. The skull from an adult Diplodocus skulls show that they had a widened muzzle with simple peg-like teeth restricted to the very front of the mouth. 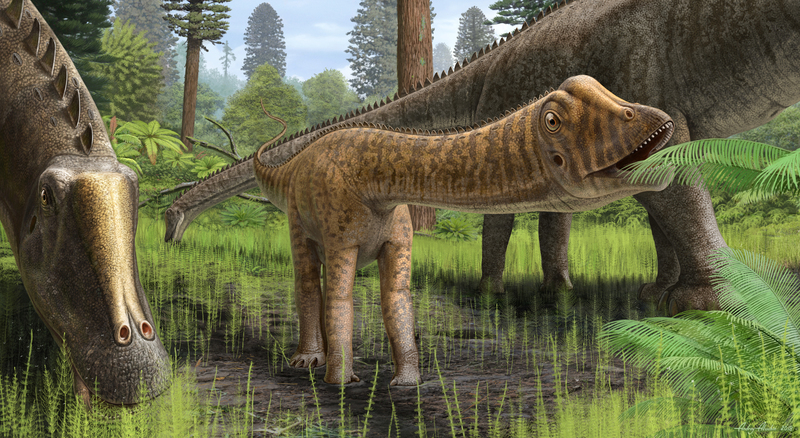 This wide muzzle with pegged teeth indicate that adult Diplodocus grazed on ancient ferns. In 2010 a “pre-teen” Diplodocus skull was described that was monumentally important because it showed that the snout was narrower and that the teeth were further back in the mouth compared to an adult. This skull indicated that young Diplodocus were probably selectively feeding, opposed to the grazing adults. But was this the case for younger, even smaller Diplodocus? Our skull – named Andrew in a nod to Andrew Carnegie who funded major paleontological expeditions and even has a species of Diplodocus named after him (Diplodocus carnegii) – was special because not only did Andrew possess a narrow snout (which supports the previous feeding hypothesis), but because of its teeth. Andrew had peg teeth in the front of its mouth, but towards the back of the mouth there were spatulate teeth. These two tooth forms have never been seen in a Diplodocus before, so why did Andrew have them? Our research team hypothesized that this combination of tooth forms is one factor that helped fuel their growth rate. Sauropods (and all dinosaurs) had fast growth rates. A 9 m long Diplodocus was between 2 and 6 years old at death, at 18 m the animal was 12 years old, and at 27 m it was in its late 20s. To grow so fast so quickly, a young Diplodocus required a lot of food. 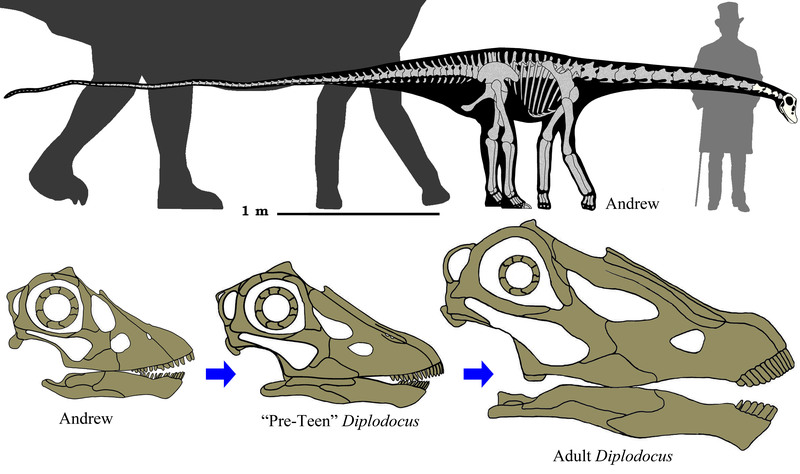 As previously shown, young Diplodocus could selectively pick and choose; but Andrew’s teeth show that with this combination of tooth forms, a growing Diplodocus could choose from a greater range of plants types to feed upon. More plants that can be eaten means more fuel, which in turn helps to support the fast growth rate. The fossil record is like a puzzle with missing pieces. With each new discovery we gain an additional piece that contributes to making our picture whole. We still have so many questions regarding Diplodocus ontogeny, but Andrew is, and will continue to help complete this picture. Do forests cool the Earth?